Comet Garradd Visible in Telescopes This Month, But What About Comet Elenin? 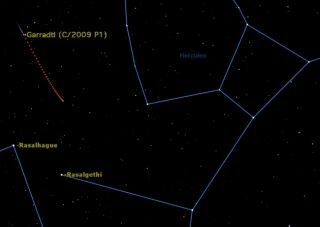 Comet Garradd will be visible in binoculars and small telescopes all through October in constellation Hercules. Although great comets like Halley and Hale-Bopp only fly close to the Earth a few times each century, there are always small comets in our cosmic neighborhood. This month, there are two to keep an eye on: comet Garradd and comet Elenin. Comets are small bodies composed of rock and ice (water and carbon dioxide) that spend most of the time in the frozen outer reaches of the solar system, in an area known as the Oort Cloud. A few times every year, a comet gets knocked out of those distant reaches and pays a brief visit to the inner solar system. The sky map of comet Garradd here shows its position across the sky this month. As the sun heats a comet up, the object's ice turns to gas and frees the dust on its surface. Solar wind then drives this gas and dust away from the sun, causing a tail to form. Comet tails are little more than empty space, but their faint glow creates one of the most beautiful sights in the sky. These tails are gossamer thin and very fragile, and can be easily disrupted by solar activity. This happened over the past few weeks to another small comet, comet Elenin. This comet had the potential to be visible to the naked eye this week, but it received a double blow from the sun and seems to have disintegrated. First, comet Elenin got hit by a coronal mass ejection, a dynamic event that unleashes a cloud of charged particles and knots of magnetic field, from the sun on Aug. 19. This caused the comet's material to disperse and its brightness to drop. Then on Sept. 10, comet Elenin reached its closest approach to the sun, and that seems to put the final nail in its coffin. The small comet failed to materialize last week in camera views from NASA's sun-watching Solar and Heliospheric Observatory (SOHO), so it seems very unlikely that there will be anything to see this week, when there was hope that it would be visible as a morning comet. Comet Elenin has been a target for conspiracy theorists, who have suggested that the comet is a brown dwarf or the mysterious and destructive planet Nibiru. As a result, Elenin has been blamed for earthquakes and tsunamis and other strange occurrences. But alas, comet Elenin is just a small, dim comet that poses no risk to Earth, and Nibiru does not exist at all, NASA scientists have said. But for skywatchers, while Elenin may be a no-show, there will be another comet visible to those willing to hunt it down with binoculars: comet Garradd. Last month, the comet traveled across the constellation Sagitta, having close encounters with two popular deep sky objects: the globular Messier 71 cluster and the Coathanger Cluster, which got its nickname because it looks like an upside down coat hanger. This month, comet Garradd can be found between the keystone of the constellation Hercules and the two bright stars Rasalhague and Rasalgethi, the respective “heads” of two celestial strongmen: Ophiuchus and Hercules. The sky map for this story shows Garradd nightly positions over the month of October; the label marks its position on Oct. 1. It will hover in brightness between magnitude 7.8 and magnitude 8, too dim to be seen with the naked eye, but easily detectable with binoculars or a small telescope. On the magnitude scale used by astronomers to measure an object's brightness in space, the higher the number, the dimmer the object appears. Meanwhile, keep an eye out just before sunrise to see whether Comet Elenin has, by some chance, survived its close encounter with the sun. If it did survive, the comet should appear in the constellation of Leo this week, before moving through Cancer and into Gemini. Editor's note: If you snap an amazing photo of comet Garradd, comet Elenin or any other skywatching target and would like to share the experience with SPACE.com for a possible story or photo gallery, please contact managing editor Tariq Malik at: tmalik@space.com.